Help Hospice once again this Valentine's! · Individually BLUE roses against a donation of € 7.00. 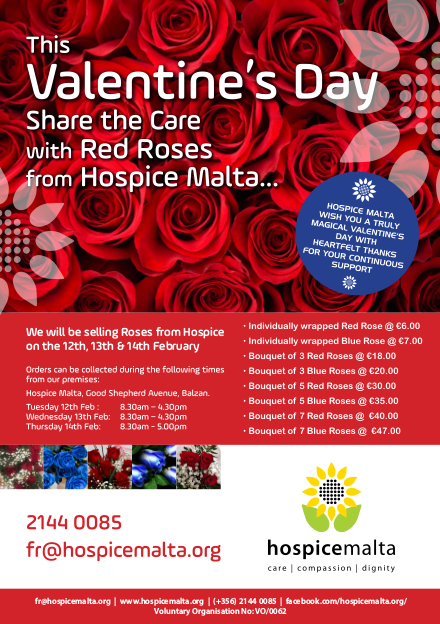 We will be selling roses from our premises in Balzan during the following days. We also deliver to companies in large quantities. Delivery for orders exceeding 25 roses is free of charge. Under 25 a charge of €5 applies. Kindly fill the attached form and send it at your earliest by the 11th Feb. Deliveries will be effected on Tuesday 12th Feb or Wednesday 13th Feb ( no deliveries will be effected on 14th February). We need your help to continue providing the best possible care and support to our patients and their loved ones. Without your generosity, we could not promote the highest possible standards of free Palliative care to people suffering with cancer, motor neurone and other serious illnesses. In 2018 over 1000 patients together with their families received Hospice services. Please help us "SHARE THE CARE”. Kindly circulate and encourage friends and colleagues to support us.